“Your Brand needs to be on Facebook.” It’s the first thing anyone says these days and honestly, it makes me wince. There’s a reason why most brand ‘Fan Pages’ on Facebook are desolate wastelands that do precisely nothing for the brand’s reputation or sales. Starting a Fan Page is easy, getting a few hundred people to join (your friends, their friends, so on and so forth) is also very easy. And then, what? How does that make your brand a Superstar on Facebook? This post is not about being a Facebook party-pooper, it’s about the factors that make certain brands a phenomenal success on Facebook while the majority report no measurable success whatsoever. Social Media Marketing is not very different from conventional marketing, when it comes down to the basics, and it is essential that the fundamentals of the latter are not ignored in an attempt to quickly adopt the former. Let’s go back and take a look at dear old Maslow’s hierarchy of needs. 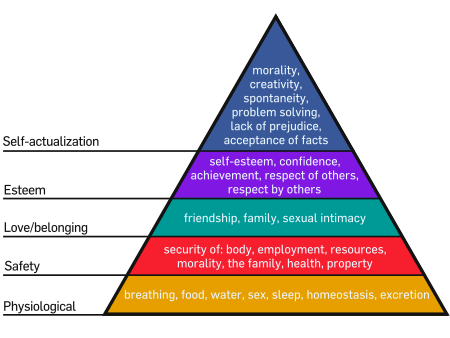 Maslow’s hierarchy is one of the first theories taught in any marketing course, as a basis of understanding the consumer’s motives behind choosing one brand over another in the market. A brand that fills up any or some of the above-mentioned 5 types of voids (or deficiency needs) in the consumer’s life, better than the competitor, will be the one the consumer chooses. Extending the theory to social media, the first question one needs to ask oneself before creating a Fan Page is what void does the brand fulfill in the target group’s life. The second question, of course, is whether that need is something a consumer would like to have all their Facebook contacts know of. In the context of consumer behaviour, social media is all about the top two deficiency needs– Self actualisation and Esteem. I might love a cheap value-for-money brand, but I really don’t want that to be displayed on my Facebook profile where everyone can see it! I might prefer a no-fuss, reasonably priced Transcend mp3 player but I’m going to be a ‘fan’ of the iPod because it makes me seem discerning, individualistic (ironically) and well-to-do. I may not care much for Body Shop cosmetics but the company has a reputation for being ‘ethical’ and ‘environment-friendly’: it gives me a chance to display my support for these causes. Am I saying that some Brands just can’t be ‘Big’ on Facebook because of the identity they have built? Yes. 5 Days later, the dust is yet to settle on Nestle’s Facebook debacle. A lot has been (and I reckon, will be) written about what Nestle did wrong and as I’ve already mentioned here, this is one for the Reputation Management textbooks. However, there are important lessons to be learnt here if a Brand uses (or is planning to use) social media for engaging with consumers. While anyone can set up a fan page – running one requires considerable understanding of the medium, and the psychology of online users. Admit mistakes: If there is a problem and you know it, you might as well as readily admit to it. Honesty goes a long way in mollifying irate people, provided it is done at the very onset of the situation. Apologising after you’ve pissed off a lot of people by acting like the playground bully doesn’t count. NEVER be condescending towards a commenter: When tempers are flaring already, you really don’t want to give anyone even the slightest reason to lash out. Because if that happens, you’re going to end up with a virtual lynch-mob on your hands like our friend at the Nestle Facebook page did, within minutes. Giving commenters lessons in grammar and spelling is not going to help your case. More importantly, if you are snarky with even one person online, soon enough you’ll have a hundred people baying for your blood, and the numbers will just keep rising. That’s how online communities work- it’s all about strength in numbers-and virtual mobs are just as hard to reason with as real mobs. You don’t make the rules in social media: Accept that by choosing the medium, you choose to talk to the consumer as an equal. Censoring comments is the surest way of upsetting people visiting your page because it indicates that you are averse to providing fans ( a term I’m using very loosely here) with a democratic platform. Always have a plan: Having a crisis management plan in place that can be deployed online at the first hint of trouble is of utmost importance. If there is a situation online, who do you call? Who responds to what kind of situation? Are you prepared to respond in multiple formats (videos, blogs, releases, forums etc)? Do you have people who can create content quickly? Apologies, statements or rebuttals may need to go out within minutes, is your Communications team prepared enough? Hire a Pro for your social media ops: It’s best not to hand over your social media ops to a person just because you think they’re young enough to “get it”. PR online is not very different from PR offline when it comes to the fundamentals, and Brands need people who understand the psyche of the online user more than people who merely know their way around social media. Respond to the online community: Case in point- Nestle’s deafening silence on their Facebook page. Keeping quiet will not help your case during a PR crisis. Responding honestly might, as it puts a human face to the corporation and shows critics that you’re listening. Oh dear. Nestle is having its backside handed to it on Facebook in what will go down in many a Business School text-book as one of the worst Social Media Fail case studies. Nestle has been facing boycott campaigns for more than 30 years now but we didn’t have Social Media in the 70s and 80s, did we? Now that we do, the crap has hit the fan and how! Their page on Facebook is flooded with uncomplimentary messages after whoever manages their PR/Social Media operations threatened to delete comments that protested against the company’s alleged role in the illegal clearance of rainforests by using altered versions of their logo, that quite ironically uses the image of a nest of birds. It all started when Greenpeace alleged Nestle’s palm oil supplier Sinar Mars was involved in illegal rainforest clearance in Indonesia. A virtual protest movement took birth with people using altered versions of the Nestle logo as their Display Pictures and posting some pretty strong comments on the company’s Facebook page. Nestle replied saying, “We welcome your comments, but please don’t post using an altered version of any of our logos as your profile pic — they will be deleted.” To nobody’s surprise that post received around 166 comments, most of which were pretty acidic. A commenter Paul Griffin wrote, “I understand that you’re on your back-foot due to various issues not excluding palm oil but social media is about embracing your market, engaging and having a conversation rather than preaching!” To which Nestle replied saying, “Thanks for the lesson in manners. Consider yourself embraced. But it’s our page, we set the rules, it was ever thus.” Uh oh. What a whopper of a fail! Nestle had cancelled its contract with Sinar Mas when the protests first broke out. But instead of assuring people who commented on their page that they had done so, were learning from their mistakes, and valued their customers’ opinions they decided to channel the spirit of a petulant 5-year-old instead. You DO NOT set the rules when you venture into Social Media, you’re an equal. You use the space to converse with your consumers and tide over a crisis like this by assuaging their doubts about your practices and products, not by acting like a playground bully. How is Nestle going to get out of this one? Social Networking has since its inception, raised concerns about how, by limiting face-to-face interactions, it actually makes users anti-social and prevents them from forming ‘real’ friendships. And while there may be some merit to these concerns, things stand to change with the launch of Social Networking sites that facilitate real life interaction between friends, thereby encouraging people to maintain a more-than-virtual connection with people in their social circle. Lunchwalla, launched this March, enables users to plan everyday social events (food being a necessary prerequisite) with friends and connections on your Social Networking sites. It also allows you to integrate your Lunchwalla profile with your Facebook profile, thereby making the good old question, “Say, do you want to meet over lunch/dinner/drinks?” all the more easier to handle. I thought that being based in the US, Lunchwalla probably wouldn’t be able to provide me with options in my part of the world (a city in India), but was pleasantly surprised when it turned up a fairly acceptable (if not very comprehensive) list of eateries in my city. And while the ‘coupon system’ that gives users discounts on their meals was understandably not available to me, directions to said eateries were. What appealed to me was that the site includes a ‘vote’ option wherein friends you have invited for a planned event (say, lunch) could vote for the restaurant they wanted to eat in, from a list of options that you provide. Having spent many hours trying to zero in on a place to meet while everyone yells “Unfair!” when you pick a place they don’t like, I love this feature. I understand the site is still in the Beta stage so I hope it also provides a version for mobile phones. Seeing that most of us these days don’t really have the luxury of having a computer around while we’re running around all over the place trying to meet deadlines, having a mobile version seems quite necessary if the site really wants to live up to its promise of a no-fuss get-together. Note: The name is a turn on the Hindi word ‘Dabbawalla‘ that literally translates to ‘Lunch-box Man’. I sensed an India Connection. I was right- one of the founders has Indian origins. I logged into my Facebook account a few minutes back and saw this new feature right under my profile picture. Twitter is all in a tizzy with people wondering what this is all about. A QR code, or a Quick Response code is a 2D bar code that when read by a camera phone equipped with the requisite software, launches the url the code is linked to immediately. Which means you can now generate a QR code for yourself using the information on your Facebook page and can then share that data by means of, say a QR code printed on a greeting card (or your backpack, if you really want to be found). You can also have your QR printed on your Business Cards or resume ( seeing that checking out a candidate’s Facebook profile does figure in most recruiter’s background check-list these days anyway). Right now, my QR generator is not working so I cannot check just how much information from our profiles we’re talking about here. Shall keep you all posted on developments. Update: It’s been two hours and the QR codes that were taken off after a mere 15 odd mins are still not back. There has been no communication from FB regarding the implementation yet. 1. You link back to this blog. 2. You cite the source.